Bring your full being to this very moment. 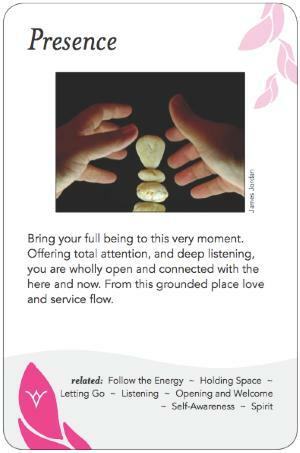 Offering total attention, and deep listening, you are wholly open and connected with the here and now. From this grounded place love and service flow. The facilitator can both exercise presence in her/his own being/actions, and help bring the capacity for presence out in the whole group. Generally, the facilitator must develop a personal capacity for being present before that capacity can be taught to or brought out in others. It entails being aware of and attuned to the sensory, intuitive and intellectual flows in yourself and in others. This increases the relevance, depth, learning, creativity and 'real-ness' of the group and its processes. The first stage is about awareness at all levels (intellectual, emotional, sensory and intuitive) and connecting these together in real time. The second stage is about removing distractions and "noise" (real and figurative), and getting yourself or the group into a focused meditative state, where preconceptions and previously perceived "solutions" can be set aside. The facilitator can help squelch preconceptions, presumptions, power politics and other 'noise' that interferes with letting go. The third stage is about suspending judgement, allowing personal and collective creativity to emerge, encouraging conversation where each participant plays off ("yes, and...") the others' ideas improvisationally, and keeping the flow open and energetic. The result can be an astonishing 'field shift' that allows new ideas to surface and be explored that would not otherwise be possible, remarkable 'aha' insights and changes in perception, understanding, appreciation and energy for action. And sometimes, if the facilitator gets the conditions just right, and there is a spark (shared problem, passion or vision, revelation), even an unpracticed group can become collectively present almost spontaneously, and the facilitator need only guide, encourage, keep open, and enable the group to 'let come' what is waiting to come out. Joy is both an enabler and by-product of presence. So is a condition in which the group is learning, quickly, together. Meditation and breathing exercises to open the heart and mind can help set the condition for presence. So can using various techniques that allow the group to engage/reengage more deeply with one another. The capacity to be present usually requires a great deal of practice to attain. Note, in some situations it may not be possible to set aside the distractions. Presence is best used with already bonded groups. A group's ability to experience this may require having the right people for the task/purpose. If the group's members aren't up to the task, no amount of presence will help. Buckminster Fuller helped a group to achieve presence by having each of them look at their hand, and see it not as a 'hand', a noun, but rather as a 'Pattern Integrity' -- a verb, a manifestation of the universe's capacity to create and continuously regenerate, since the hand is always changing, even in the cells that make it up. Many people report achieving greater presence through the practice of meditation, martial arts, use of mind-altering substances or walks in nature. In times of collective trauma (e.g. natural disasters) groups can often achieve a remarkable degree of collective presence very quickly. Meditation and Focusing are two (among many powerful processes that can support one's practice of presence.